What does a Data Revolution in Africa look like? The Heads of State and Government at the 23rd AU Summit within the Common Africa Position on the Post 2015 agenda were convinced of the need for structural transformation for inclusive and people centered development in Africa. They tersely came to an agreement on how such a developmental approach requires the creation and enhancement of adequate policy space and productive capacities, notably through infrastructure development; science and technology; transfer and innovation; value addition to primary commodities; youth development and women’s empowerment. They also agreed that this approach requires addressing the challenges posed by climate change; desertification and land degradation; drought, loss of bio diversity; sustainable natural resource management; and the promotion of a responsive and accountable global governance architecture. Critical to this discussion therefore is: how can data assist in mitigating these challenges and existing gaps whilst offering new insights on how to accelerate development across the continent? During the two day National Forum on harnessing the data revolution for sustainable development held in Nairobi Kenya between 28th and 29th August 2015, multi stakeholders from government, private sector, academia, nonprofit organizations, local communities and development partnerships convened a midst whetted ambition to begin addressing the informational aspects of development decision making in a coordinated way. “Where will the locus for disaggregated data be situated with the shift in development trends? Will it be open data sources, national statistics offices or will it be with philanthropy organizations that are increasingly shifting to partnerships with the private sector? ODA is decreasing in countries such as Kenya which have shifted to middle income status. Will it be in conjunction with private sector organizations? How will this revolution look like?” asked a keen participant in the audience. These are fundamentals questions reeling in everyone’s mind as crucial conversations on the data revolution embark in Africa ahead of the Sustainable Development Goals being acceded to in September 2015 and the convening of the World Data Forum scheduled to be held in 2016. Without high-quality data providing the right information on the right things at the right time to the right people; designing, monitoring and evaluating effective policies becomes almost impossible. Institutions require bolstering to manage and steer this new shift in development with adequate resources and political will being the key priorities to making this a reality. How will this happen amidst the current challenges facing the continent? Below is an info graphic highlighting some of them. The sparking of a conversation on harnessing the data revolution for sustainable development marks Kenya’s first step in working towards a global partnership for a data revolution, establishing the country as a leader on the African continent and globally. Nonetheless, a common challenge facing majority countries in Africa today, Kenya not excluded, is the lack or inadequacy of fundamental statistics measuring the quality and quantity of taxes and trade, births and deaths, or even growth and poverty. Add on to this the mis-match in priorities between governments in Africa and the donor community. Governments alike require sub-national data to help guide budgetary and policy decisions while on the other hand external donors often want national level data to make allocation decisions across countries; this priorities have often been misaligned further exacerbating the already existing data gap. As espoused in the Africa Data Consensus, a sustained data revolution is needed to drive social, economic and structural transformation in every African country. Such a revolution will also make it easier to track our countries’ progress towards meeting national and globally agreed sustainable development goals, with a view to leave no one behind. The building blocks for an African data revolution are already in place. National Statistical Offices have long been the backbone of data production and management, producing official statistics and supporting data activities to create accurate and timely data for decision making. However, today’s development challenges and prospects call for a broad data ecosystem that spans the entire value chain driven by national priorities and underpinned by the Fundamental Principles of Official Statistics. This ecosystem must be inclusive of all forms of data – including official and other data – and involve all stakeholders. The African continent is growing, and it is doing so at an exponential rate. The Africa Pulse, World Bank’s biannual analysis of economic trends and data in the continent projects that economic growth in Sub Saharan Africa is rising from 4.6% in 2014 to 5.2% in 2015-2016 and 5.3% in 2017. The report highlights that among other key actions, increased public investment in agricultural production is critical in driving growth in the region. Further, it also identifies the gripping challenge facing Africa as a whole; the lagging behind in achieving the Millennium Development Goals particularly in eradicating extreme poverty. Africa has achieved only a third of the poverty target of halving the proportion of people living under $ 1.25 a day. Why is the continent floundering? In the case of several African countries, it is evident that growth of the agricultural sector is a paramount component for both rural development and poverty reduction as the sector absorbs the increasing number of job seekers and generates income and livelihoods for others. With majority of the farmers being female, it is then a wonder why women are the poorest African citizens. In Kenya’s case, the Ministry of Devolution and Planning’s status report on the Millennium Development Goals recognizes that the country is still faced with a wide gap between the genders which emanates from a strong paternal system among most communities as well as traditions and social norms of the past. A large number of women have no tenure security, lack of access to credit facilities, with their contributions most times going undervalued as they are constantly demoralized from meaningfully engaging in the very economic activities that are propelling the country forward. Some countries have since revised their constitutions making a number of positive changes for women, especially economically. This includes increasing women’s access to institutions and justice; and ability to control and use property. Customary laws which contradict new legislation many of which cement gender inequality are also now considered invalid in these countries. It no longer is tacit information that empowering girls and women yields undeniable returns for everyone in the community. When women work, they invest 90% of their income back into their families, compared with 35% for men. Inclusion of women postulates higher incomes in households, better wellbeing of children and future generations subsequently reducing poverty across the spectrum. Policy alone therefore does not affirm women’s progress. Our satisfaction or dissatisfaction when addressing gender parity should be based on performance indicators. There needs to be deliberate and vigorous efforts by all development partners to ensure strong visibility, actionable commitment and implementation of this. Currently, UN Member States, the UN system, civil society organizations, academia, research institutions and other stakeholders around the world are engaged in various processes to negotiate a new global framework for sustainable development – the post-2015 development agenda. As we move from the Millennium Development Goals (MDGs), several stakeholders are actively advocating for a development framework, which integrates a comprehensive strategy that ensures the realization of women’s rights including economic, social and cultural rights, and civil and political rights. The 3rd International Review Conference on Financing for Development that will be held in July 2015 in Addis Ababa is a crucial process that will aim to address the financing needs for sustainable development. At the moment, Member States are looking towards the conference to come up with an integrated policy framework that changes existing patterns of mobilization and effective use of all sources including public and private, domestic and international finance. A regional strategic meeting on the Post-2015 development agenda and financing for development is being organized by FEMNET, the Post 2015 Women’s Coalition and AWDF. The organizers recognize the intersectional manifestations and challenges to women’s rights and gender equality. The main aim of these regional meeting is to facilitate collective action and create a space for organizing for the upcoming Financing for Development Conference in the Continent. A video for the generation shaping the world: explanation of what Sustainable Development Goals are, where they came from, and how we can help achieve them. Engineer Peter Magiti, Principal Secretary of Planning at the Ministry of Devolution & Planning, Kenya, gave the keynote address as he officially opened the forum . His sense of concern and urgency for the youth to take up their place in development could not be underscored. He reiterated the need for youth to raise their voices and demand tracking mechanisms on youth policies across the continent. This includes incorporating accountability at the micro, macro and systemic levels of development. Four panel discussions took centre stage with the first panel engaging the youth in a dialogue highlighting their objectives and expectations that they foresee from the forum. The second being a discussion of the Sustainable Development Goals in context. 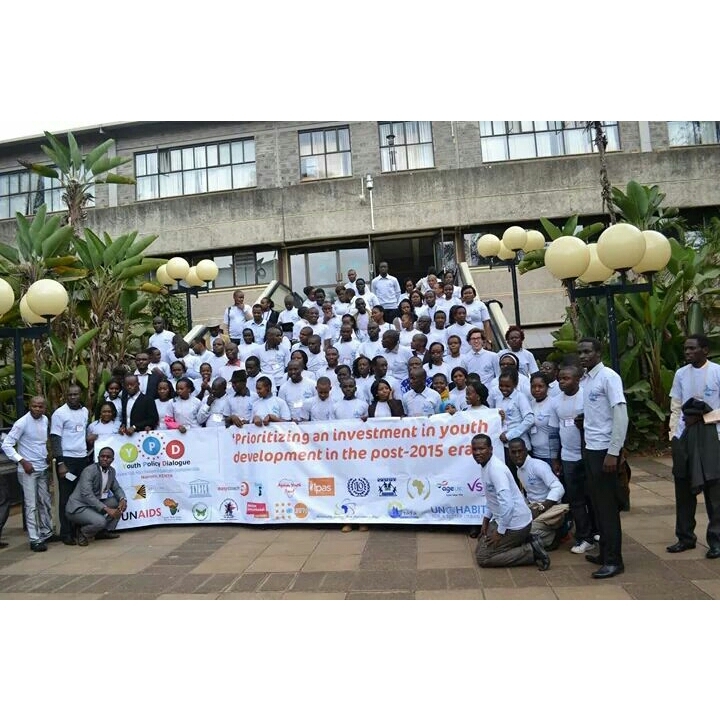 Thirdly, the inclusion of youth in the post-2015 agenda. Finally, the critical assessment of the AY African Youth Decade Plan of Action in the context of the AU Agenda 2063. Mr. Freddy Lutonadio from the Voice Africa Future campaign, in his high spirited address echoed the Principal Secretary and emphasized the need for quality education, good governance and access to quality health care. Furthermore, his remarks emphasized the need for youth policies being action oriented, balanced and committal. Among some of the other key contributions by fellow delegates was the need for clear articulation of ideologies regarding trade and investment in Africa. Do the youth understand trade and investment in Africa? How do we keep abreast or hold our governments accountable in this regard? Being part of the youth, I strongly believe that all the youth and I should keep abreast with the trade and investment contracts being signed by our respective governments. Africa being the rising star in the globe it is apparent that a lot of development is taking centre stage. How then are the youth being engaged in this? Are the labour policies transparent? Are our needs being met or are we only receiving the short end of the stick? I leave that for you to answer. Another concern that resonated with me was the issue on how equipped with information the youth are, but which is more important is the quality of information the youth is engaging themselves with. This raises the question; are we reading enough? Or Are we too impatient to absorb what we have read? Are we keeping abreast with current affairs and ratified government treaties? Throughout the forum one thing that came out clear and concise was that as youth in Africa we do need to step up our role in the post 2015 agenda and there is dire need for our voices to be heard. Here is a useful link to understanding the post 2015 agenda It .is no secret that Africa’s most prized possession is the youth. The human capital demographic on the continent is outstanding and exciting to say the least! How then do we ensure that this most prized possession is safely guarded and nurtured to its optimum potential for a global force of change. Another persistent point that crossed my mind as the dialogue came to a close is the continuous participation of youth in such like forums with no substantive follow up thereafter. I do advocate for more of these forums as it is through them that we get to share information and learn from each other’s triumphs and trials. However, do we go back to our home countries and actively call for action from our governments? And how do we go about this? Or better yet, are we involved in the institutional frameworks that deal with these issues? Are there structures that allow us to do this to begin with? And if not, how do we go about challenging this? These are questions whose answers still remain unclear. The buck stops with our generation. In my opinion, it is paramount for these forums to have capacity building sessions to train youth on how to lobby governments to push for our agendas, our inclusivity and transparency. We need to move past mere participation to influencing decision making. Our governments no doubt have an uphill task in ensuring investment in youth development is executed and they can only achieve this if we the youth assist them in doing so. And this can be done by the youth actively constituting and influencing the youth development. We must move from elitist dialogues to actively contributing in national action plans and strategies on youth policies. Let us benchmark this with set targets and goals and not just leave these ideologies up in the air. Let our voices not only be heard but felt.